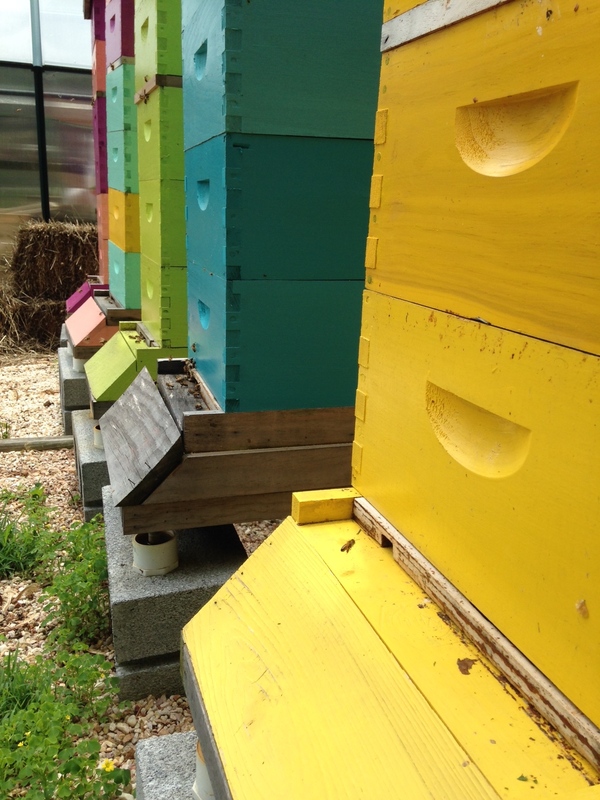 You may recall that we lost Yellow Hive over the winter. 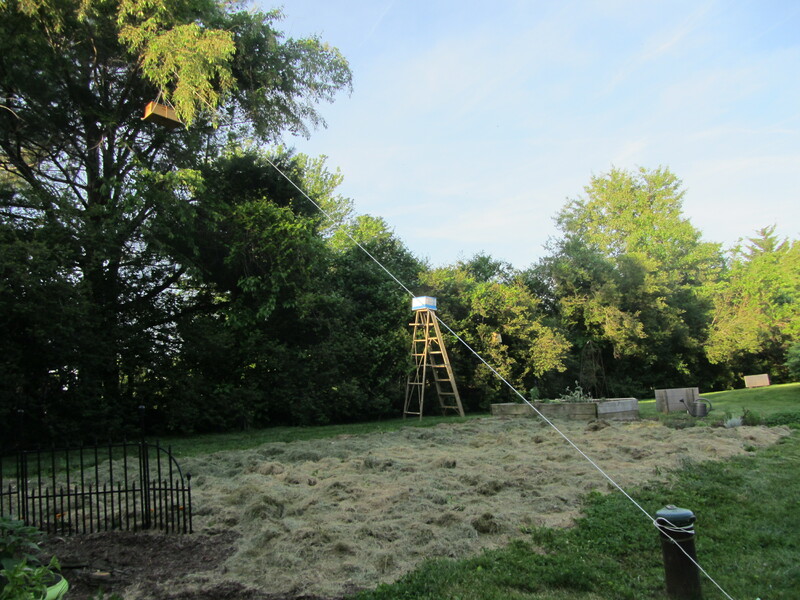 The apiary just isn’t complete without all 5 hives going at once. Blue Hive was looking strong, so two weekends ago ((May 24th) I transferred some of their honey, nectar and brood frames to Yellow Hive, along with some healthy looking queen cells, and of course some bees. I gave them sugar syrup w/ my homemade Honey B Healthy and stood back to see if the split would take. I didn’t post this sooner for fear of jinxing them. I’m very superstitious like that. They started slow, but now activity in Yellow Hive is picking up. Yay! The weather has been cool and wet, so once the sun comes back out and things dry out, I’ll give them a look to see whether a queen has emerged and started laying yet. Any day now I’m anticipating that Blue Hive will swarm. I know that because I’ve seen queen cells and a virgin queen romping around. There is space in the brood chamber for laying, but when they decide to go, they’ll go. 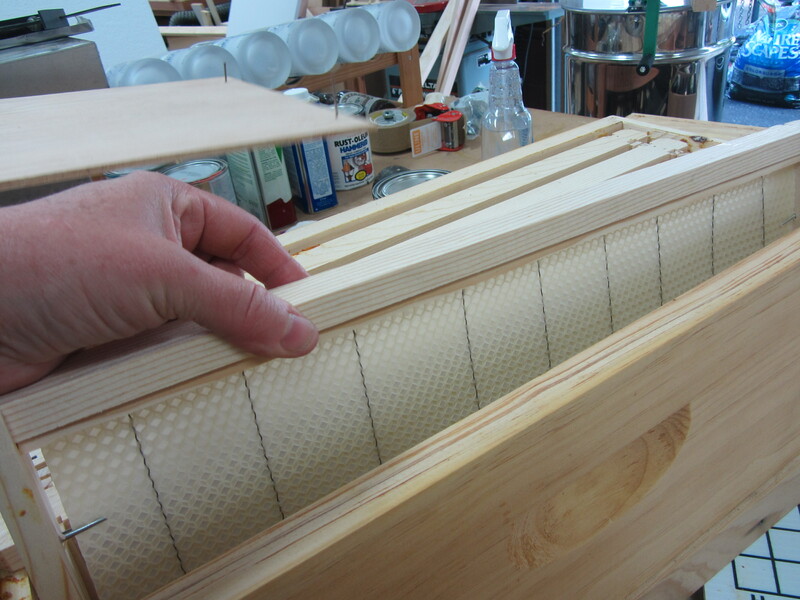 Fingers and toes are crossed that they’ll split themselves and will make a bee-line for the swarm trap. I continue to add lemongrass oil to the entrance to lure them in. 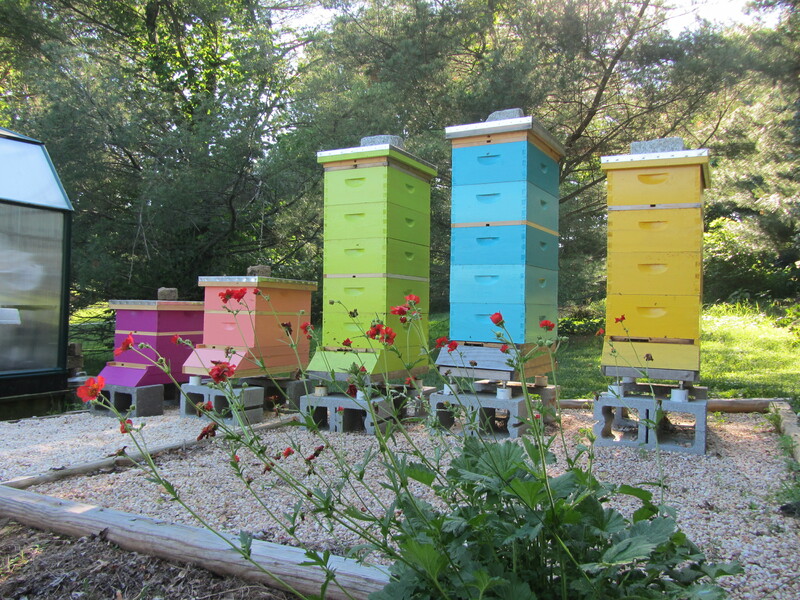 Then I’ll collect them and add them to a new hive. Speaking of new hives, the hubster and I have had discussions about the number of hives I can add to my collection. He insists that 5 is enough. Yes dear, 5 is a good number. 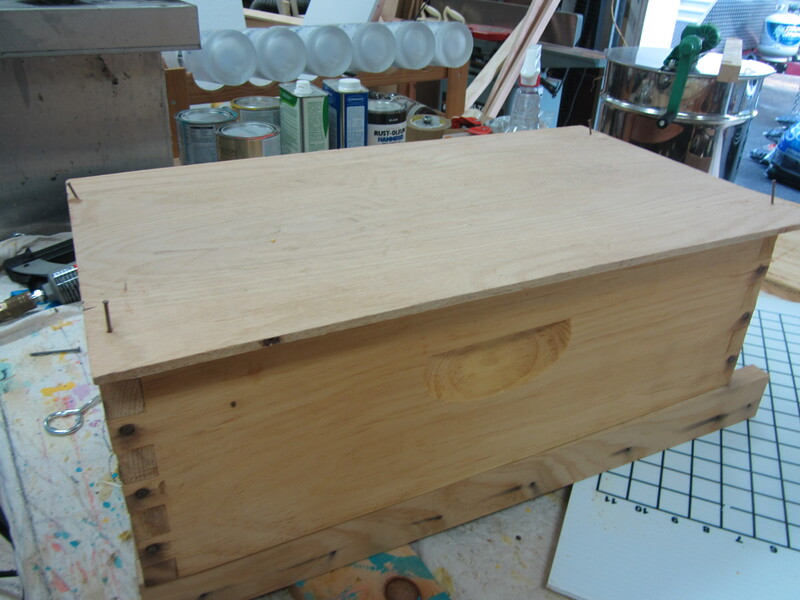 However, if I d happen to catch a swarm, then they need to go somewhere, so just incase they decide to cooperate (a rarity) I’m preparing hives 6 and 7….just incase. After all, I couldn’t possibly let them go homeless! We also planted the garden two weekends ago. Another yay! And with the recent rain, they’re popping up nicely. We’ll bee caging tomatoes today, and even my cucumbers are popping up from seeds that I salvaged from last year’s cucumbers, which were crazy prolific. The major nectar flow is dying down, but there’s still plenty of flowers and color coming up. The wildflowers will be out soon. The bees are bringing in the honey. 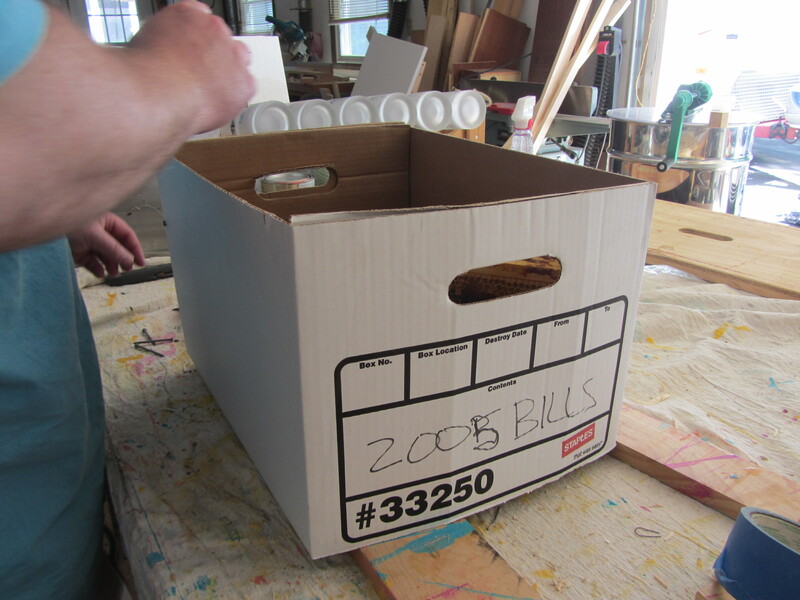 Boxes are heavy and filling fast. Tis a happy time of year. The whole yard is blooming, from evergreens to honeysuckle to clover. The girls are hauling in the nectar and pollen. 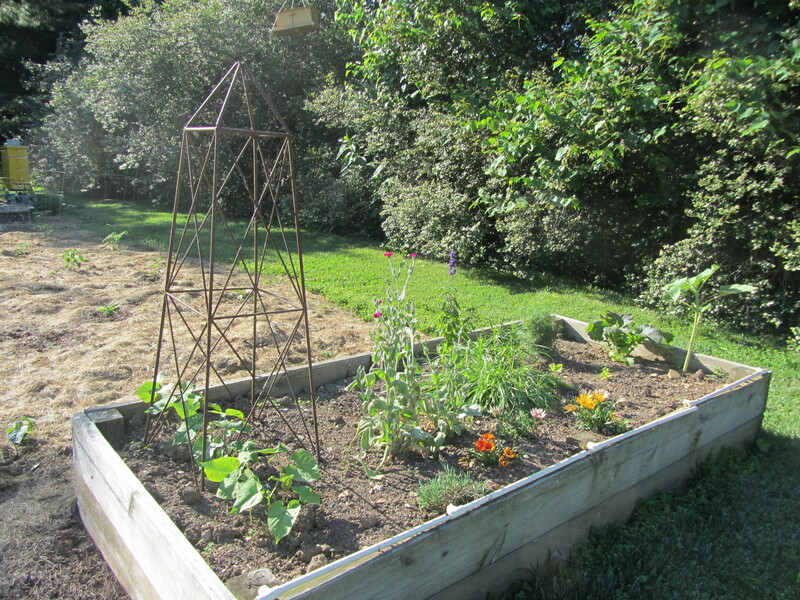 The veggies are planted and staked. We’re harvesting asparagus and strawberries. I love the spring and summer months, even more since we have bees. I could sit in the garden all day and watch the hives. I’m still amazed at how far we’ve come in one short year. 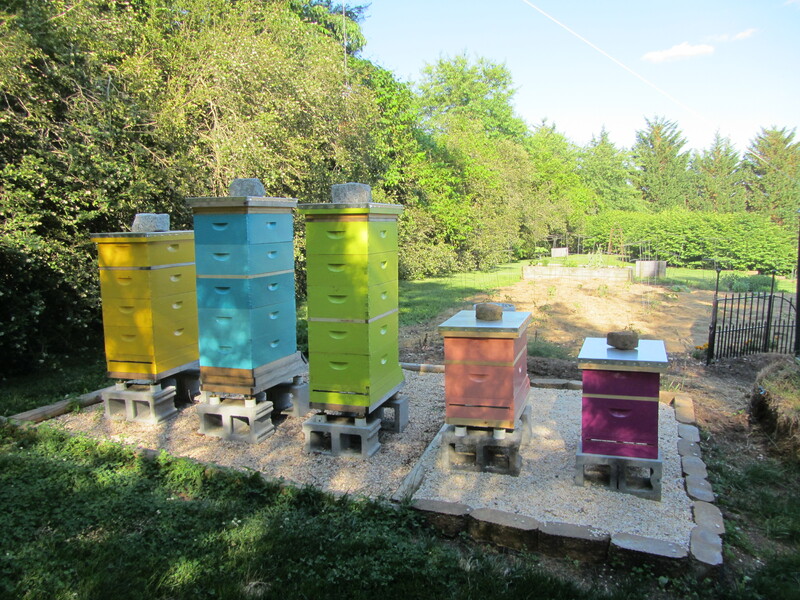 From two nice to five hives. That’s right! 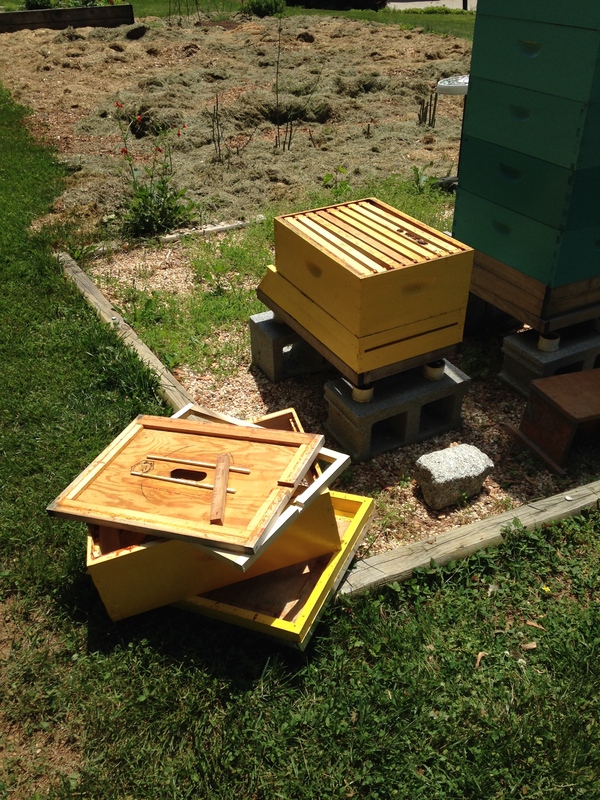 We now have 5 hives. After missing out on the split from Blue Hive’s swarm, I took several frames of fresh brood, larvae and eggs from Green Hive and made a split while there’s still enough time in the season for them to queen themselves and become established. Although I might just help them along if I can find a queen locally. As always with my splits, I closed them up for two days to allow the smell of their queen to dissipate, then placed branches in front of their entrance so they could reorient themselves and return to their new location. It’s working. They’re going and coming with legs full of pollen. 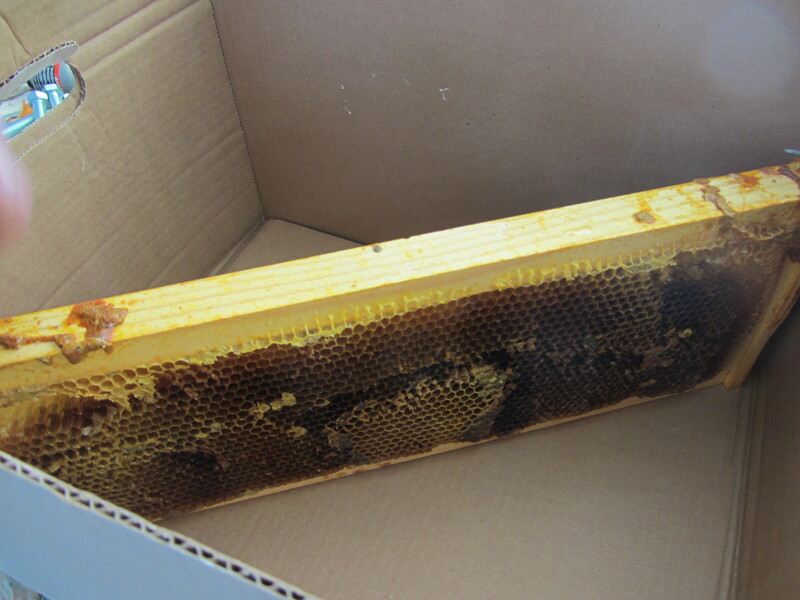 A few robbers are floating around, but for the most part, the big hives are leaving their new little neighbor alone. 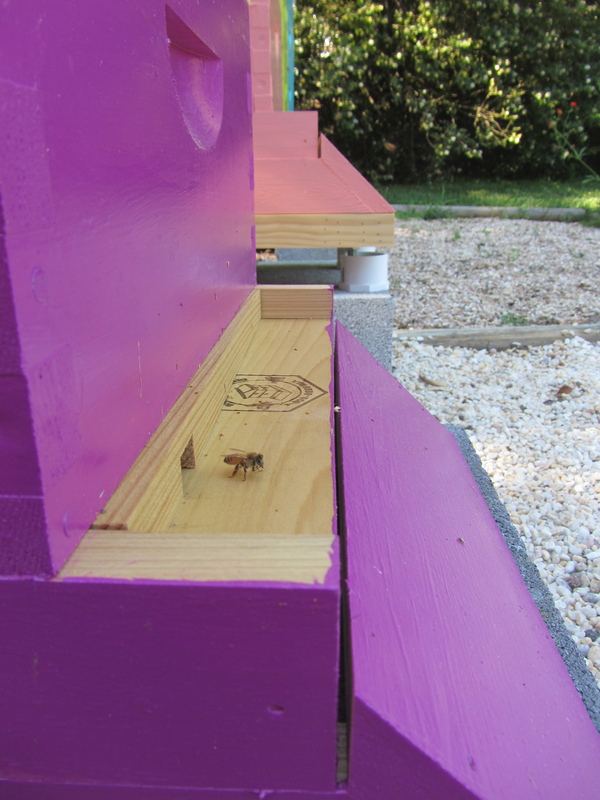 Pink Hive has eggs, brood and larvae, which means they have a queen. Yay! All those queen cells transferred from Blue Hive did the trick. They’re drawing out their frames and I’m preparing to give them a second box of drawn comb and new wax foundation. 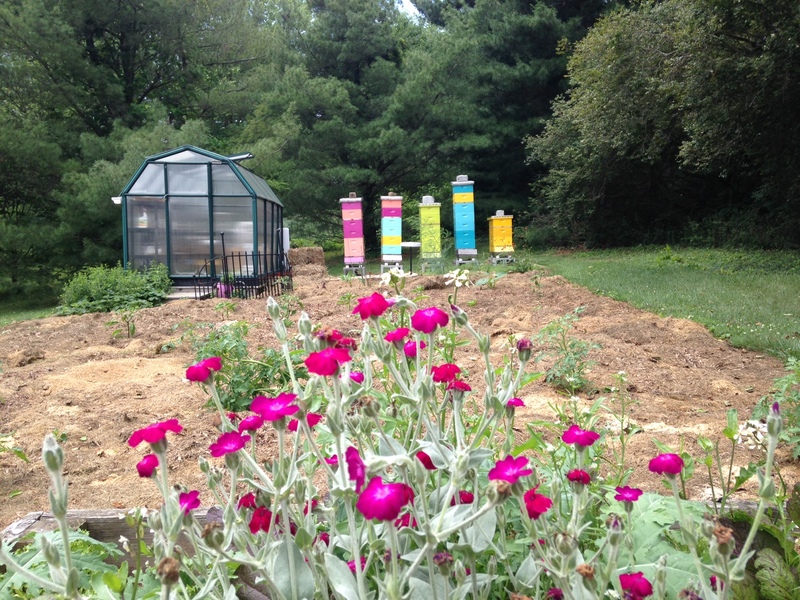 Blue Hive, on the other hand, has gone from tons of brood to no brood. Queenless, for now. 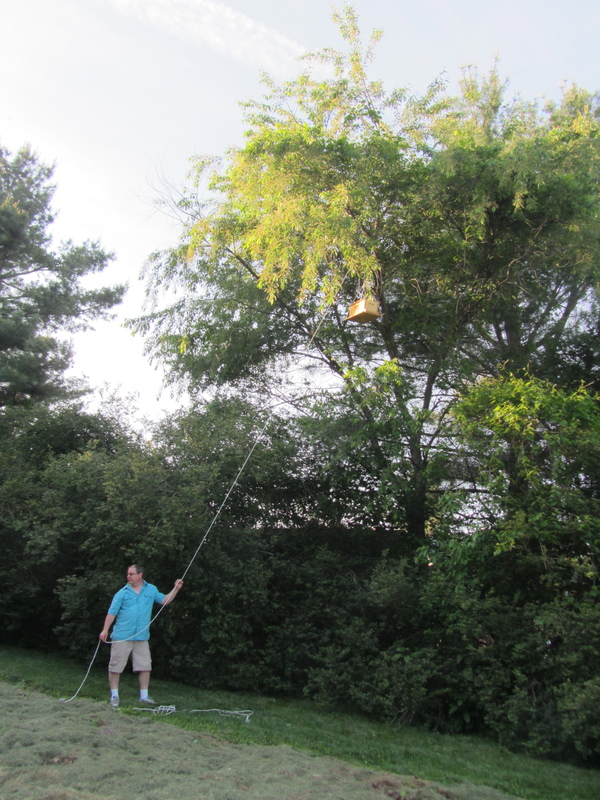 I was told that after a swarm it would take 3-4 weeks for them to straighten themselves out and have a laying queen. I’ll check back in another week or two and see if they need any help. 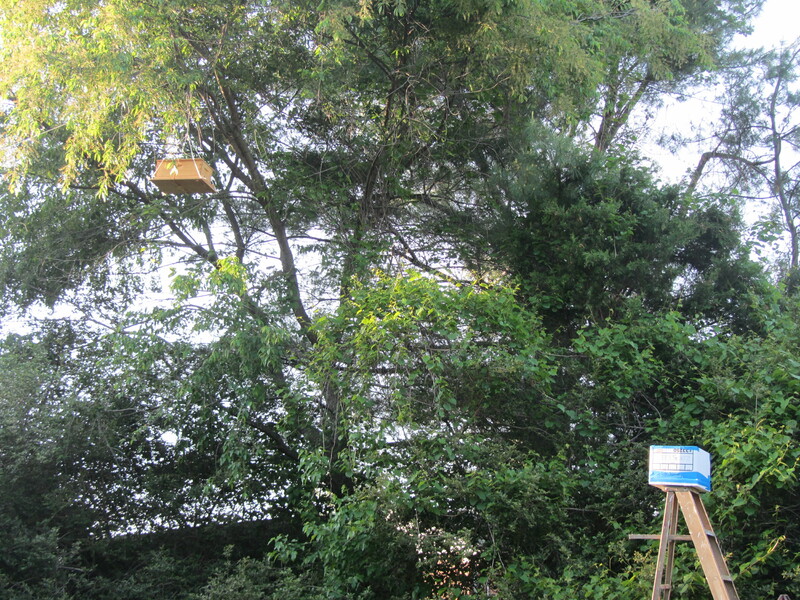 Their numbers are still strong, but they’re packing in nectar where there should be brood. Nectar that should be going into the honey supers. Blue Hive has barely made a dent in their one honey super. The frames are still empty and undrawn. Disappointing since they were so active and strong. I was hoping for a good honey harvest from Blue Hive. I’m starting to have second thoughts about my Texas bees. Once good thing about the swarm is that the mean wicked queen left behind a calmer, less aggressive (albeit less productive) colony behind. Let’s hope their next queen is a little nicer. Yellow Hive is active and well, but they’re not growing as fast as I’d hoped. I was ready to give them a third box, but based on the number of frames they have yet to draw out, they aren’t ready for it. So I’ll just be patient and let them tell me when they’re ready. I just added another super to Green Hive. They’ve just about filled their first super, and boy is it heavy. 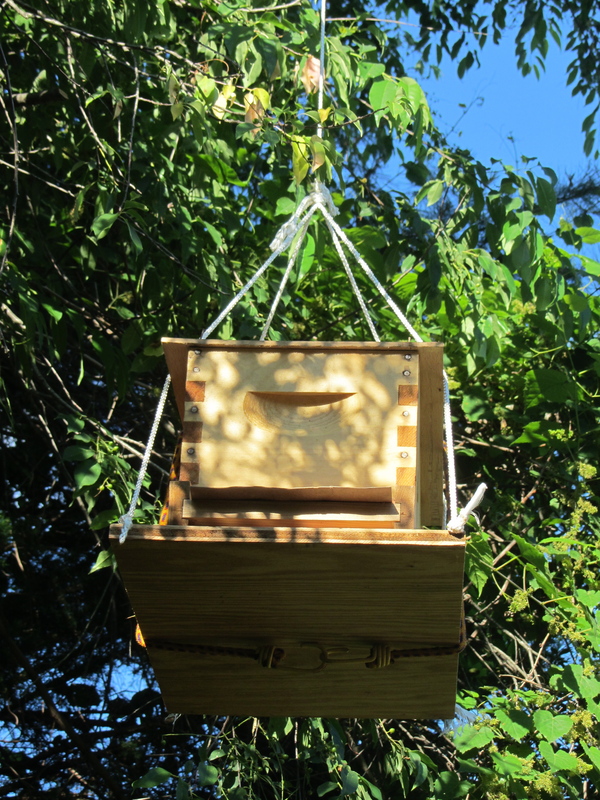 Green Hive started out slow, but they’ve picked up and are very active and healthy. I’ve heard that about the Carneolan (Italian) bees. No signs of swarming yet. No drones, no queen cells, no hot temperament. My Italian bees are very gentle and calm and I can work them with minimal smoke. 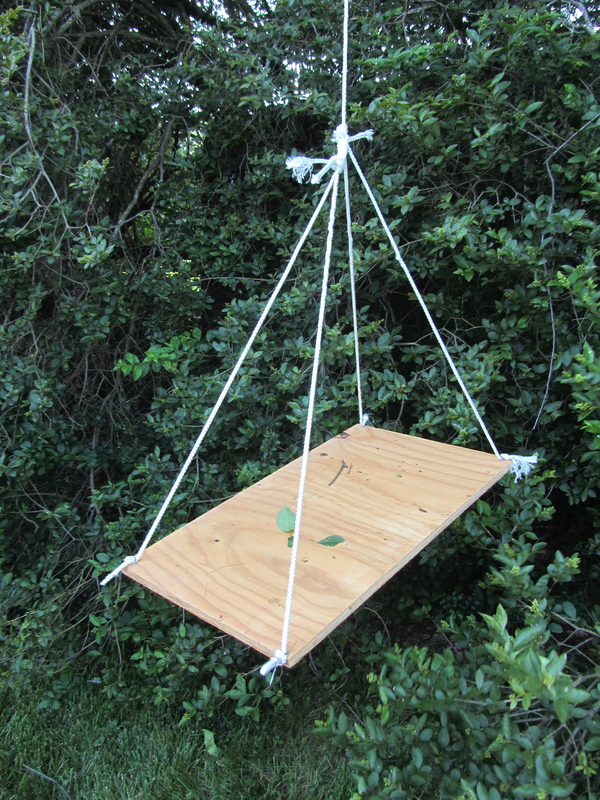 Incase they do have thoughts of swarming, we’ve left the bait hive hoisted up in the trees with a cardboard sheet at the entrance that’s been drenched in lemongrass oil. Someday we’ll catch a swarm. I forgot to mention that a bit of honey dripped out of some burr comb in Green Hive’s super. I couldn’t resist taking just a little taste. Oh my. No sugar syrup, no chemical treatments – just pure, unadulterated honey from our own hives. Wow…really…just wow.